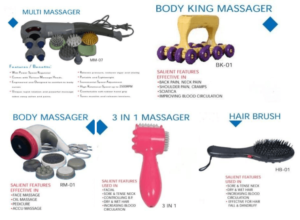 In our third and last series on the health related corporate gifts we are focusing on various massagers to help you identify and pick up the best promotional gift to connect with your product or services. MULTI MASSAGERS as the name suggest comes with various massage heads with power speed regulators engineered and designed to comfort to body curves with rapid rotation for powerful message to take away aches and pains. This portable lightweight massager with comfortable soft rubber hand grip and high incremental adjustable rotational speed of 2500 rpm apart from toning muscles and releasing tensions also relieves pressure, restore vigour and vitality. For improving blood circulation and overcoming back pain, neck pain, shoulder pain, cramps and sciatica you can go for BODY KING MASSAGER as shown below. We also have choice of face massage, oil massage, pedicure and accu massage as shown below as BODY MASSAGER. 3 IN 1 MASSAGER helps in facial, sore & tense neck, controlling BP, dry and wet hair apart from helping in increasing blood circulation. You also have choice of HAIR BRUSH effective for preventing hair fall and dandruff. The brush also helps in reducing sore and tense neck, increasing blood circulation if used on dry and wet hair. WELLNESS KIT as the name suggest is excellent in helping relax the skull, sore muscles and in stimulating blood circulations. Due to multiple heads, it has excellent massage system to help alleviate stress due to powerful vibrations to submerge your body. 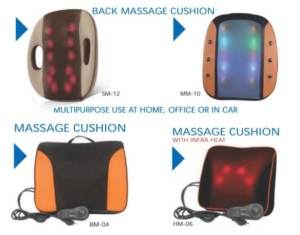 Multipurpose BACK MASSAGE CUSHIONS for use at home, office or in car including with infra heat as per the various choices shown below. NECK MASSAGE CUSHION as per the images shown below to help you select the best product keeping the purpose and the budget in the alignment. Please also refer to our earlier two articles on health wherein first was focussed on cold and hot masks, ice bag, seat pads, travel packs and back support solutions. Second article focus was on accu paduka (slippers), accu rollers, accu matts, foot soles, night mask, ear plugs, yoga matts, neck pillow, neck belt, figure twister and steam inhaler. Please do revert back through email if you don’t find the particular business gift item in all the 3 articles.